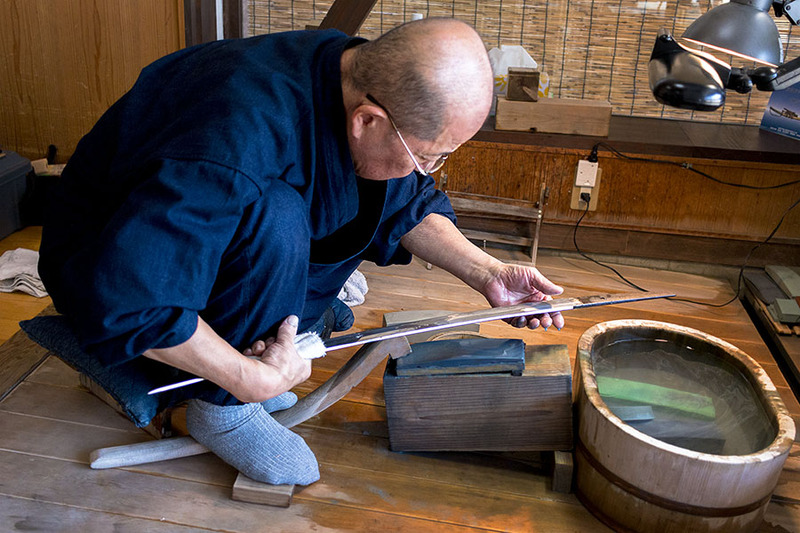 Takayama Toshio, sword polisher and sharpener, works the blade of a hand forged katana at Bizen Osafune Sword Museum. A hand engraved tsuba, or handguard. Scabbard production at Bizen Osafune Sword Museum. Bladesmith Yuske Ando teaching in his paper knife making workshop. Filing the edge of a paper knife in Ando’s workshop. Checking the edge of my paper knife. My newly made paper knife in action. As a longtime admirer of medieval arms, I simply couldn’t pass up the opportunity to visit Bizen Osafune Japanese Sword Museum, especially as it’s located in Setouchi city, Okayama Prefecture — an area with a millenia-long reputation for producing Japan’s finest blades. When we first arrived, we started out with a tour of the museum and its impressive collection of swords, many of which date back well over 1000 years. The museum offers quite a few English language brochures, and (pro-tip) can even arrange for an English-speaking tour guide if given advance notice. And let me tell you — the swords you’ll see on display are breathtaking. 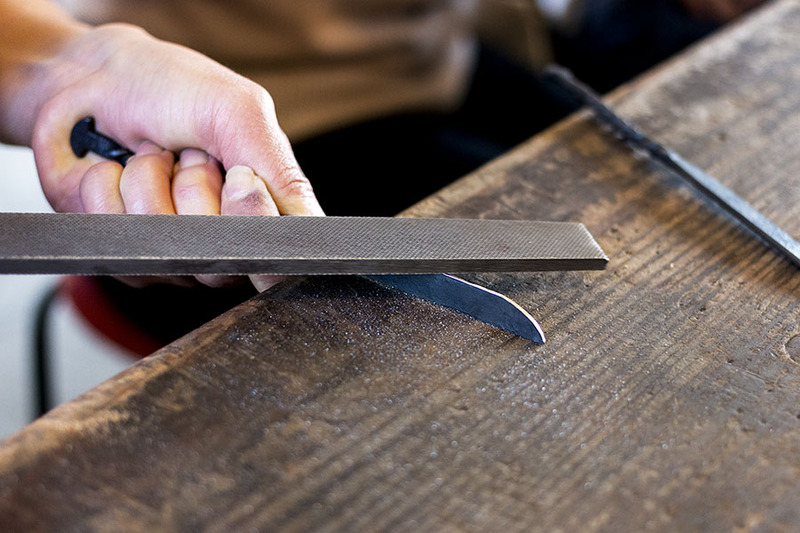 Japanese sword-making requires three key resources — ironsand for making ore, red pine for creating charcoal that burns hot enough to forge steel, and water for quenching the blades. With mountains rich in iron, forests lush in pine, and the Yoshii River all near at hand, Bizen naturally developed into a sword-making epicenter. However, from the beginning Bizen had more going for it than just natural resources. Sword artisans would not only engrave their names beneath the handles of the swords they made, but would also apply, as a way of indicating the region in which they worked, a specific hamon (the iconic “temper line” running down the blade, itself a byproduct of the hardening process). As a result, hamon patterns operated almost like trademarks representing different sword-making regions — so much so that copying hamon patterns from other areas eventually became prohibited by law. Even so, craftsmen from outside Bizen would still occasionally copy the Bizen pattern, as any katana bearing a Bizen hamon would sell for a far higher price. Tellingly, there exists no record of Bizen craftsmen copying the hamon of other areas. However, Bizen katanas aren’t simply a relic of Japan’s samurai past. 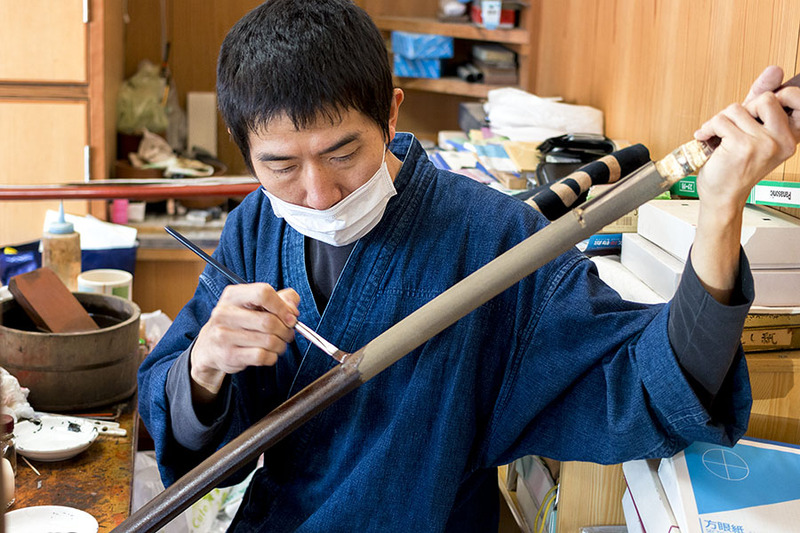 In fact, artisans in Bizen continue to produce and sell katanas to this day. And those who buy new swords do so for a litany of reasons. For example, sometimes people purchase a katana as a traditional 60th year gift, or as an honorary offering to lay on the casket of someone who has passed away (then called a makuragatana, or “pillow katana”). Another old tradition which some still follow involves bequeathing a tanto (traditional Japanese dagger) to a bride upon her marriage as a way to ward off evil spirits (or potentially bring her marriage to a premature close, one would think). Even so, sales for new swords have been declining. And if that weren’t bad enough, modern swordsmiths face another challenge in the pursuit of their art — decreasing access to raw materials. With the prices for materials going up, so too have the prices of traditional blades. 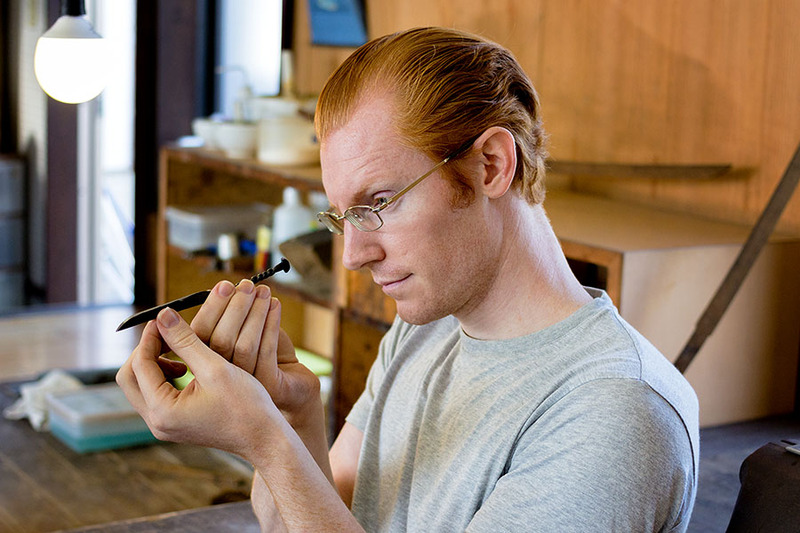 Additionally, only artisans who have passed an exam organized by the Japan Agency for Cultural Affairs can become swordsmiths in Japan — and even then, swordsmiths can only make 24 swords a year at most since regulations require that each traditional katana takes no less than 15 days of active labor to create. 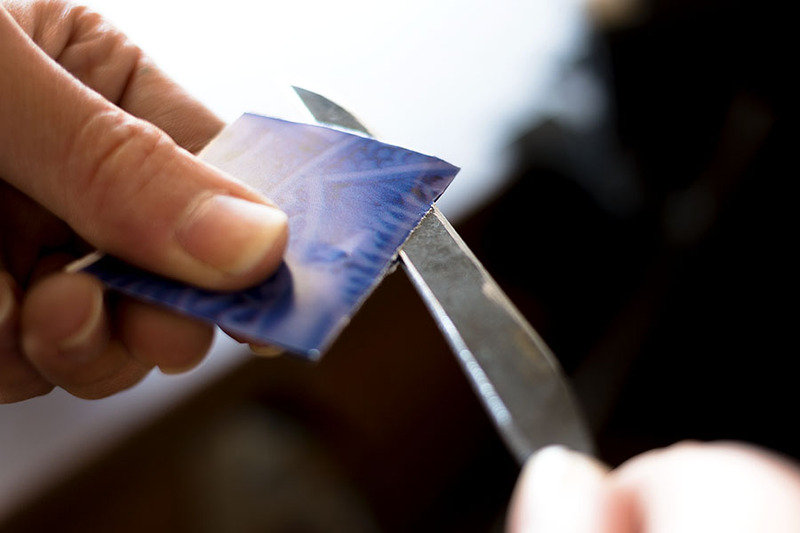 Between these restrictions, and an economy in which people often deprioritize luxury expenses, many swordsmiths now struggle. “As less people buy authentic blades, more and more swordsmiths are having to give up their art because they can’t make a living,” says Ando. Against this backdrop, my partner and I joined Ando’s class to make a paper knife. 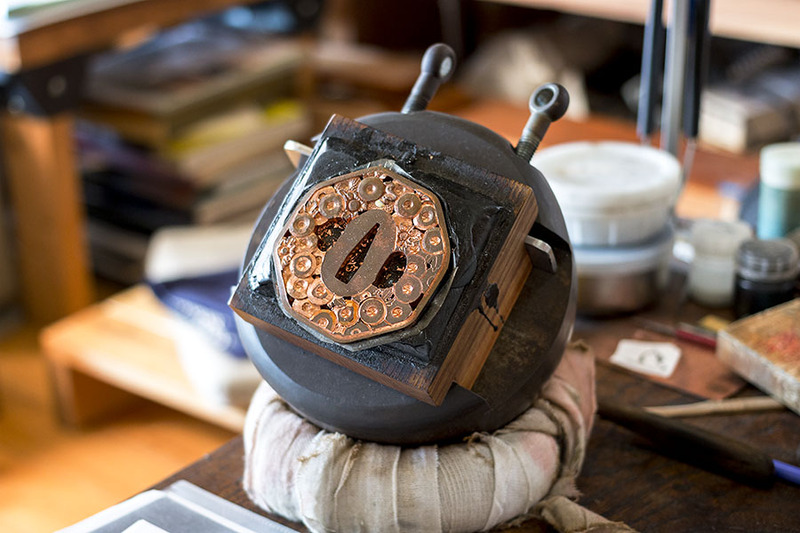 Provided with iron nails which Ando himself had twisted and hammered into shape, he instructed us in the use of the file and set us to work honing the edges of our soon-to-be paper knives. The process took some time and gave our forearms a good workout — I can only imagine what kind of strength and endurance are required to make an entire katana. Yet after some time, we started to get pretty fearsome edges going on our little paper knives. All the while, Ando stood by with friendly advice and ready assistance when anyone had a question, as well as scraps of paper on which to test our creations. We had a great time, and I definitely recommend Ando’s class to anyone visiting the museum. Due to the largely physical nature of the workshop, a lack of Japanese language skills shouldn’t pose much problem. At the end, we chose from among several colorful origami sheathes to protect our freshly sharpened blades, and thanked Ando for our lesson. Walking through the workshops surrounding the museum, one can see other craftsmen at work, too — an engraver, a scabbard maker, a sword polisher, and more. Watching them work felt like peering back through the mists of time. Commissioning one of Ando’s swords was a little out of our budget at the time of our visit, but having seen the quality and history of Bizen craftsmanship firsthand, I wouldn’t be surprised if one of his blades winds up gracing our mantle someday. Until then, I take comfort knowing that the ancient arts of Bizen will live on in the hands of craftsmen like Ando — keeping vigil by the light of their forge fires.